A very encouraging start to the week especially given the declines seen in the US late on Friday. Many were concerned Asia would continue the US wobble, which were the preliminary moves for Shanghai, Nikkei and ASX. However, after the initial moves were rejected most moved to recover early losses. The Hang Seng was the star core for the region as financials and tech helped the index to a 1.3% return for the Monday. Shanghai closed up +0.3% as we await president Xi Jinping’s speech tomorrow. The Yen resumed its weaker tone this morning and looks comfortable playing around the 107 handle. Exporters and tech have helped the Nikkei with an afternoon rally and managing a close near the days high (+0.5%). 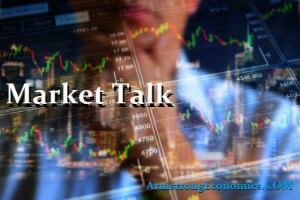 The Asian rebound only lasted until US markets opened, and so we see nerves starts to return with Asian futures drift in quiet trade. Core Europe was mixed ahead of the US open having seen an early rejection of the Asian strength. UK’s FTSE has been heavy all European morning but is probably the result of Sterling catching an early bid. One of the key talking points was the replacement of John Cryan (CEO at Deutsche Bank). Its shares rallied around 4%, which was probably the only reason the DAX managed a small positive in the morning session. However, DB failed to hold it gains (closed +1.2%) at the US opening, although strong, was insufficient to help Europe further and so levels eased into the close. Managing a small gain for the day was actually a result as confidence turned sour by end of day. US was a little hesitant at first but then rallied over 400 points by mid-session. A refreshing boost after Fridays nerves but still there is so much uncertainty in the wings. US/China trade dispute, Syria headlines, FED nerves – although softened after the NFP report – and finally Q1 earnings numbers start next week. We remain in no-mans land for a while yet but are seeing signs of DXY revival. The final two hours of trading were hit on headline talk that the FBI had raided the offices of president Trump’s personal lawyer, Michael Cohen. This is likely to dominate headlines for tomorrow until the markets fines clarity withy the situation. Will be interesting to see this week if we do challenge last weeks lows even though it is unlikely. Japan 0.04%, US 2’s closed 2.78% (+1bp), 30’s closed 3.01% (u/c), Bunds 0.50% (+2bp), France 0.73% (u/c), Italy 1.76% (-2bp), Greece 3.95% (-1bp), Turkey 12.7% (+3bp), Portugal 1.66% (-1bp), Spain 1.22% (+1bp), and Gilts 1.40% (+1bp).